The Honda Win, made for winners ! First, get rid of the unnecessary. From the extreme temperatures of India to now in here, we could remove 6kg of luggage and send them back home. Then as we did in India, we transformed our 2 backpacks into one of 12 kg, and lied it down on a rack welded at the first day of the journey. If you still need something here, you can find it at any city. Second, do like the locals. We may dedicate a post to this topic later on. The Vietnamese use their motorbikes for everything. 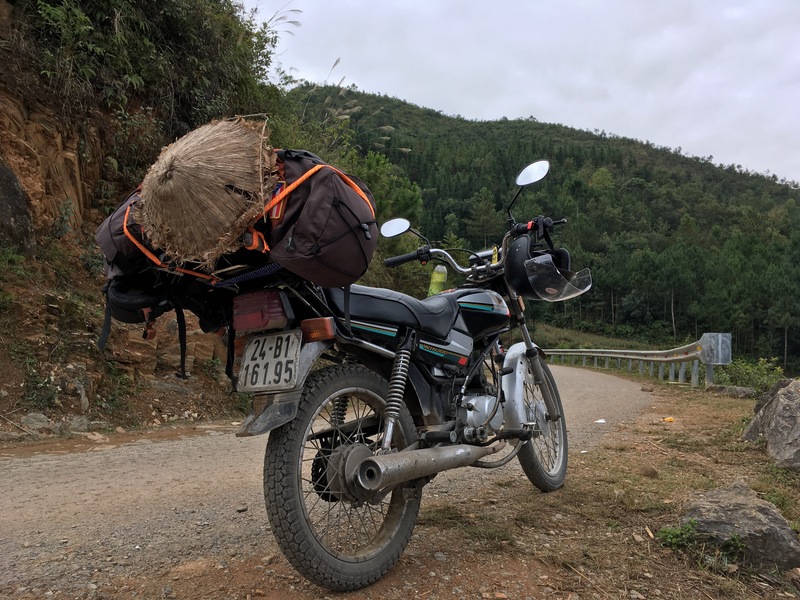 Transporting bags of cement, food, a living pig, a box of chickens, iron bars lying on the road, 3 people… Many backpackers met on the road travel together on the same bike. But remember the road is dangerous and you can’t hit the road without the next steps. Third, maintain your bolide. Garage maintenance is cheap, quick, easy to find. Oil change every 500km, daily chain lube and tension, daily brake and engine checks. This will make your journey safer. Fourth, ride safe ride slow. The traffic can be hard, especially overtaking and trucks using the full width of the road. Moreover the views can make you stop at any time. So take it easy, shorten the daily distance and enjoy your journey. Publié dans ExpeYatra, Viet-NamÉtiqueté asia, dongvan, hagiang, hondawin, motorbike, vietnamMettre en favoris le permalien.